12 Months - $19.99 Only 3 left! Don’t get us wrong. Cows are great! In fact, they supply the basis of some of our favorite foods: ice cream, cheese, ice cream, milk, ice cream, butter… and did we mention ice cream? What kind of world would it be without Double Chocolate Fudge or Cherry Fudge Ripple? What would we eat out of the carton after a bad breakup, or at our birthday party, or for breakfast when we’re feeling really lazy? Maybe that’s the reason you wanted to dress your baby up like a cow. Maybe you love black-and-white spots. Maybe you like how they sound. 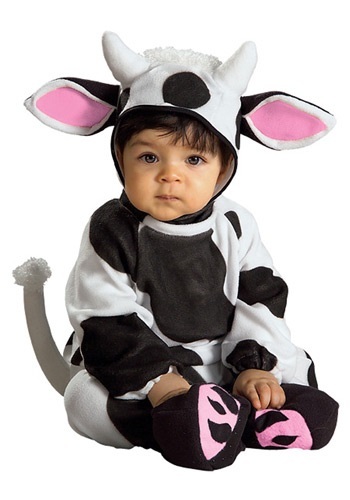 There are many reasons that could induce someone to dress their child up as a hoofed bovine, but there’s only one solution: our Moo Cow Baby Costume. This black and white romper is a perfectly a-moos-ing cow costume for any little calf. It comes with a stuffed cow tail and a headpiece with attached ears and horns, as well as cute pink accents on the feet and ears. This Moo Cow Baby Costume is so great, your little tyke will want to wear it until the cows come home! We were very pleased with the product and speed of delivery/shipping. We were also pleasantly surprised by the warmth of the costume. It was nice to not have to worry about covering up the costume when taking our infant outside, although we did have a layer of clothes underneath.